Today is the 1st of Muharram 1427 in Libya , that is the first day of the month of Muharram in the Islamic ( lunar ) calendar. Happy New Year everyone. It will be the 1st of Muharram tomorrow in North America. In the meantime the Chinese celebrated their New Year according to the Chinese calendar on January 29th this time, we are in year 4703 now. Happy New Year of the DOG everybody. What is your chinese zodiac? and element? do you think that they are illustrative of our personality ? Other Highlander link on these topics. The Libyan city of Ghadames is renowned for its unique style of architecture, traditions and culture. Amongst these interesting traditions is the one found in a typical Ghadames home where a small peephole is made into the front door. A visitor would look through it inside the house at a reflection in a mirror hung on the wall opposite the door. This mirror reflects the picture of an oil lamp placed on a shelf. 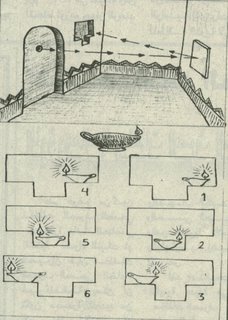 There are 6 positions for the lamp, and these positions inform the visitor of what’s going on in this home and so help him to act/decide accordingly. Whilst reading the local press in May of 2001, I came across an artist's drawing and a brief explanatory text of what I was talking about above, unfortunately this is not available online to be linked too and I could not find the author to credit him/her. So whoever you are thank you for this explanation. However I did cut out the diagram with the symbols and here it is for you dear readers. 1-There is a wedding or engagement in the house. 6-Father home please come in! How cool is that ? Those Ghadamsi people were such an ingenious society. 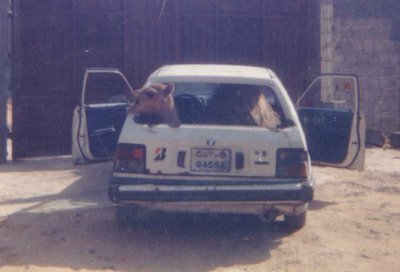 Camels are an ordinary sight here in Libya, but I don't know what is this one doing in this vehicle - a bit too tight of a spot for such a large animal. 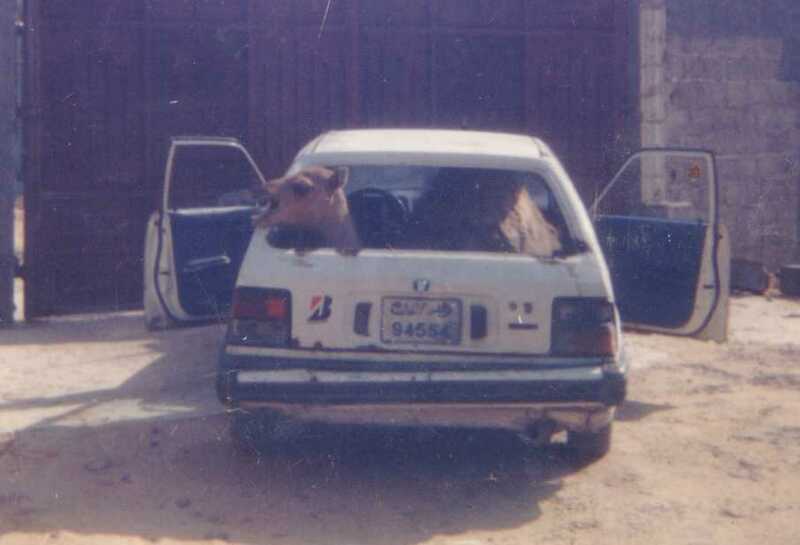 This is a Honda Civic parked in front of a garage door obviously in Libya. Have been a bit lazy lately and delayed the introduction of some more Libyan blogs :). Anyway they are doing pretty well without it ... still here we are everybody please welcome 7mada ( you've seen him commenting here) . He is so refreshing and lives in Britain. The other blog Flying Birds has 3 members : A. , Serrag and Esra. Thanks Khadijateri for leading us to it. That's all for today , if I get more news I will share them here. A frivolous post to lighten up the mood . I am officially an ipod fan! yay . I recently acquired the nano , more like a few months back and totally forgot about it until a couple of weeks ago . Since then its been so great I just wonder why did it take me so long to accept it ? Maybe I did not want to be blindly following fashion ? be one of the herd . Oh but it is sooooo convenient, I have converted my favourite tracks there and it is such fun , especially when you have it on shuffle . Plus you can add your favourite photos as well ! Use it in the car , walking , shopping , working out ... I love it , it brought back the days of the CD walkman and other stuff. To all those who left me offline messages, I am not ignoring you my friends, I honestly could not read them as they get dropped when I loose internet connection. Somebody decided to repair something in my street and the nitwits have been working for the past 2 weeks ruining my telephone cables in the process!!! 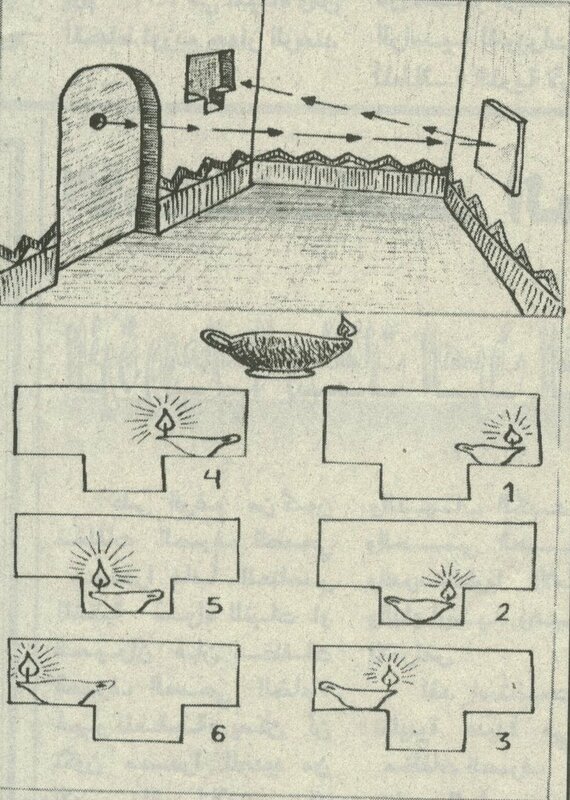 I don't know why should the vibrations of a buldozers cut the telephone tone ? ( any engineers out there with hints ?) . It makes for unhappy haphazard blogging and surfing. So please bear with me, I wil reply to your emails, listen to your voice messages , and answer your questions . The only thing I cannot do is know what you wrote in the offline messenges, therefore if it was important please email it to me and I shall eventually see it, and if it was urgent then call me ( those who have my number). Eid Adha Mabrouk everyone. Please let me not interrupt you from the discussions on the other posts. Predicting the future has become a favourite pastime on New Year’s Eve. We are familiar with the scores of psychics and analysts lined up on TV shows who bombard us with what they ‘read’ will happen in the next year. Also we must not forget the written media too. In our era knowledge is the most important commodity and if you know the future then you can prepare strategies for it, or wait in awe. I can’t recall which philosopher stated that if we knew what the future had in store for us we would choose not to find out but rather to let it happen if anyone knows this quote please send it to me, I’m too lazy to research it!). On the other hand, an old Arab saying states ‘kadaba al munajum wa law sadaqu, i.e astrologers are lying even if they say the truth , the purpose of this is that supposedly these oracles can find out about parts of the ‘present-future’ due to their dabbling with the occult etc.. but only God knows the what the future holds and hence they ‘lie’ because they cannot predict all of and are bound to make mistakes which could be fatal. December 2005 was no exception, and the Lebanese TV is never one to miss that. In Libya we watch a lot of Lebanese satellite TV stations (along with other of course) and it has become a tradition to decipher what the stars have in store for us. Many wait for this night and cancel any appointments to watch the pundits. I won’t analyze what each tarot reader, crystal gazer, astrologist or analyst said, but I’ll attempt to give you the gist. Because of the events going on in their country, and it being a Lebanese channel, the utterings of the guest speakers were especially valuable, with a sense of urgency for the Lebanese viewers. I noticed how even the hostess of the talk seemed nervous and somber. This comes in the aftermath of all the 2004 prophecies for 2005 coming true, or at least could be interpreted to adapt to the occasion –Hariri etc.. So Lebanese were understandably anxious. Fortune teller A: ‘if you thought that 2005 was bad for the Middle East , I can assure you that 2006 will have nothing to envy it’. Fortune teller B: ‘the current cycle of violence and bad karma for ME started in 2000 and will last for 10 years. That is only after 2010 will death and killing stop’. Thank you that’s encouraging, only 4 more years of blood baths. Fortune teller C: ‘I’m sorry I will not be able to have our usual chat this year , I have specific orders not to talk about any event’ . I guess the government does not wish to increase the citizen’s panic. The situation is very precarious indeed. Fortune teller D: ‘I lift the veil a little , Sharon will be gravely ill and probably die, his successor will be even more of a hardliner and this will translate into more hardship for Palestinians’. Ok so far we know that Ariel Sharon is in a coma . ‘The situation in Syria, Iraq and Lebanon will not see any change until 2007 were the planet X will affect the ascending Y and something will happen’. D does not say if it is good or bad, donc we assume the worst. Needless to say the Lebanese and Arab viewer a quite concerned and worried , specially about the guy who refrained to talk. At the end of the show you could see that the hostess was getting quite emotional. Falling into this category are the annual reviews and analyses and ‘estimations’ for next year. Aljazeera carried out an interesting one Libyan Leader and the Egyptian thinker/journalist Mohamed Hassanein Haykal. In his comments about the region, Libyan Leader said that Damascus had done it’s role in Lebanon and holds the merit for effectively ending the civil war, and its pull- out has resulted in a lot of calamities. With regards to common Arab cooperation, roughly translated he said ‘it is a common Arab hypocrisy , malice and an alliance with the enemy against one’ , it seems he forecasts that the Arabs will never have any ‘presence’ or future. Simpson from the BBC, thinks that “Osama bin Laden will be tracked down, but will not be captured alive” . While I think that if whoever was tracking him wanted to get him they would have years ago, he serves his purpose better alive than dead and also better on the run than in prison where he could not be blamed for every deviant youth. Of particular note are points 4, 6 and 7 ! “As for the average Arab citizen, what would make him or her happy? One, if the government were to leave office, that would be a big reason for happiness. Even bigger if the government leaves office and goes to South America. I would suggest seeing ministers go on trial, but that could lead to people dying of happiness. Two, US forces and terrorists defeat each other in Iraq, so that Iraqis could get on with their lives. Three, the government talks about democracy so much that it believes itself, and democracy is established and the government falls. Four, during the upcoming com! petition between Likud and Kadima, Ariel Sharon kills Benjamin Netanyahu, or vice versa, while the killer is sent to prison for life. Labor returns to office to continue the peace process from the point where Sharon broke it off. Five, the reader is blessed with friends, job opportunities, good health, a bad memory, and a hidden conscience. If the reader remembers that there is something he or she wants but hasn't obtained, he or she will be happy with the things he or she has, and not wants. Six, they say (who's they?) that happiness is a married woman and a single man. But this takes into the realm of the impossible. We should remind the reader that Haifa Wehbi, Nancy Ajram, and Shirine are all single. The reader will truly become happy if he marries one of them in 2006, even though they say being single is a condition for happiness among men. Seven, the reader falls asleep and doesn't wake up until 2007, or 2017, to get beyond 2006 and every year that won't br! ing happiness to Arabs. Eight, half of Arab newspapers and magazine s, and three-fourths of satellite stations go bankrupt and are permanently closed. In fact, more than half of the Arab press and about 90% of Arab satellite stations are already bankrupt, but they continue to operate, magically, through unseen means, just like Arab governments. Nine, 2006 passes without seeing the dreams of Arab optimists fulfilled, and neither the nightmares of Arab pessimists. Ten, we defeat Burkina Faso in football (there have been no military victories since the conquest of Andalusia; we've been losing capital for 13 centuries). Eleven, the government stops issuing laws that deprive citizens of everything that makes them happy. Twelve, an intelligence agent receives a bomb from his president, to assassinate another Lebanese journalist, but it explodes and kills them both. The investigation continues and reveals a terrorist network responsible for all of the crimes committed in Lebanon since 14 February 2005. Thirteen - I'll stop here, sinc! e the number 13 is unlucky. They say you get double bad luck if the 13th falls on a Friday, so I'll just let the reader dream of a better year [sic]”. Sooner or later, it was going to happen – the stroke I mean- the guy is hyperactive and overweight, has a lot of pent up anger, worries about Israel’s security, about voters , about the corruption case he was implicated in. I am surprised he held out this long. But Sharon is a tough man I must give that to him. As a human being regardless of his cruel and bloody past I will ask that may God prolong his life and spare him or shorten his pain if he is dying. As someone who has done a lot of harm in the ME and who was blatant about it then I must admit that I felt it is kind of ironic that he may soon join Arafat his archenemy in the afterlife. If as the medical reports say that even if he survives he may be severely brain damaged, I think that would be a very cruel way to spend the rest of his life..some people may call it Karma. For many Israelis he is a hero, and for the other camp he is a butcher. I absolutely understand the way he acted, because he was being true to his vision, and he stuck to it. Sharon’s death will not herald a new era of peace, because in my opinion , the next PM will try to outdo Sharon to sound credible to his people and that can only bring more cruelty and bloodshed in the ME. I am going to pray for his recovery. God let Sharon live, at least he knows the situation and the people know how to deal with him. An Arab proverb, (and I’m not sure if it is Libyan or not anymore) states that ‘when the cow falls, the number of knives increases’. Basically the number of those ready to butcher it increases when such a massive animal is unable to defend itself. This allegory in my opinion perfectly fits the situation of Syria currently. Syria is now caught between a rock and a hard place and no one is willing to give it a chance. Moreover, MSM, journalistic pretenders and pundits are riding this wave because it makes good coverage and serves to sell front page news. I don’t object in principle to constructive criticism and analyses. However, I find it hypocritical to jump on the bandwagon once Syria and its regime are no longer under the aegis of western power who have discarded it like a used towel. That is, to me at least it seems as if western interests do not include Syria anymore and so the shield of respectability it provided for her is gone, uncovering Syria’s raw flesh to the ‘hungry’ masses clamouring for blood. Bloggers are no exception to what is happening and the Lebanese blogosphere is full of speculations and accusations about Syria’s alleged responsibility in the wave of destructive murders of political and media personalities which have taken place since the killing of Hariri. Hariri’s death is the issue of an ongoing UN investigation, and the famous Mehlis report if you read it carefully does not prove anything but mainly speculates and attempts to connect the strings to find out the truth. As we stand many of the strings lead to Damascus but nothing more. There is absolutely no evidence. So maybe the ‘innocent until found guilty’ and ‘due process’ should be applied in this case as opposed to sanctions, war, unrest, and the democratization process a la Bush to destabilize the country. I WANT THE TRUTH just like everybody else. I can understand the feelings and approach of the Lebanese bloggers, but I don’t think that other bloggers myself included could pretend to know what is better for Lebanon and Syria more than those concerned. And though I do not advocate censoring, but at times silence is indeed golden, sensational blogging no matter how good can perpetuate a lot of myths in the mind of readers unfamiliar with the Middle East. So when I saw his recent , loud and frank anti-Syrian rhetoric , I was slightly bemuzzled knowing his usual fairness in treating any issue. This prompted me to change my approach and seek the Syrian bloggers and what do they have to say on the historical events unfolding in their countries. After all, would not they have more first hand experience of Lebanon and Syria than myself or anyone else? I mean I’m not going to stand here theorizing and inciting hatred or love when they could say so much better. If I thought that the Tunisian blogosphere was varied and interesting, I was amazed at the quality of the Syrian blogosphere. The spectrum of opinions is large, to name but a few randomly : Karfan (against everything is he for real? ), Catherine (courageous with thorny subjects), Sasa (budding journalism), Damascene ( her family's Iraqi ordeal), Ayman (check the tallest Christmas tree in the ME) and numerous others. I have a whole new world to discover, their links will lead you to other unimagined riches.